Bishop Innokenty of Ussuriysk, a vicar of the Vladivostok diocese, paid an archpastoral visit to the Democratic People’s Republic of Korea from May 29 to June 1. 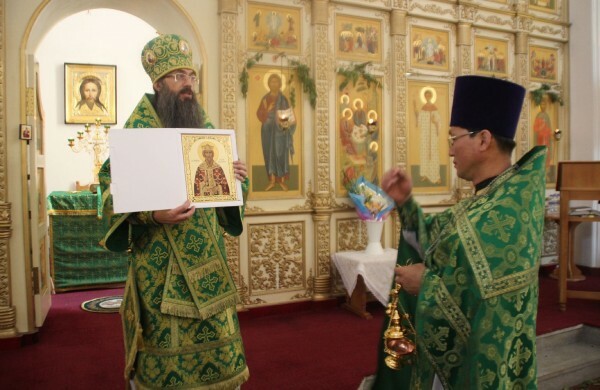 He donated an icon of Grand Prince Vladimir to the Russian Orthodox church of the Holy Trinity in Pyongyang with the blessing of His Holiness Patriarch Kirill of Moscow and All Russia on the occasion of the celebration of St. Vladimir’s demise. On May 30, the Ancestor’s Saturday, Bishop Innokenty celebrated requiem service for Russian émigrés and soldiers of the Soviet Army at the Liberation monument in Pyongyang. That same day in the evening, Bishop Innokenty celebrated All-Night vigil in the Church of the Holy Trinity and Divine Liturgy on the feast day. Attending the service were staff member of the Russian Embassy and representatives of the North Korean Orthodox Committee. Press Office of the Vladivostok diocese reports that the delegation of the Vladivostok diocese visited Botanic Garden, Aqua Park and Memorial to Kim Il Sung, architect of the Democratic People’s Republic of Korea.